Antifa’s activists say they’re battling burgeoning authoritarianism on the American right. But it is an absolute FALSE premise as it is organized and controlled by Billionaire Leftist George Soros and other Leftist political and Social organizations. These groups are IN FACT fueling the HATRED and the VIOLENCE instead! Since 1907, Portland, Oregon, has hosted an annual Rose Festival. Since 2007, the festival had included a parade down 82nd Avenue. Since 2013, the Republican Party of Multnomah County, which includes Portland, had taken part. This April, all of that changed. Next, the parade’s organizers received an anonymous email warning that if “Trump supporters” and others who promote “hateful rhetoric” marched, “we will have two hundred or more people rush into the parade … and drag and push those people out.” When Portland police said they lacked the resources to provide adequate security, the organizers canceled the parade. It was a sign of things to come. For progressives, Donald Trump is not just another Republican president. Seventy-six percent of Democrats, according to a Suffolk poll from last September, consider him a racist. Last March, according to a YouGov survey, 71 percent of Democrats agreed that his campaign contained “fascist undertones.” All of which raises a question that is likely to bedevil progressives for years to come: If you believe the president of the United States is leading a racist, fascist movement that threatens the rights, if not the lives, of vulnerable minorities, how far are you willing to go to stop it? In Washington, D.C., the response to that question centers on how members of Congress can oppose Trump’s agenda, on how Democrats can retake the House of Representatives, and on how and when to push for impeachment. But in the country at large, some militant leftists are offering a very different answer. On Inauguration Day, a masked activist punched the white-supremacist leader Richard Spencer. In February, protesters violently disrupted UC Berkeley’s plans to host a speech by Milo Yiannopoulos, a former Breitbart.com editor. In March, protesters pushed and shoved the controversial conservative political scientist Charles Murray when he spoke at Middlebury College, in Vermont. As far-flung as these incidents were, they have something crucial in common. Like the organizations that opposed the Multnomah County Republican Party’s participation in the 82nd Avenue of Roses Parade, these activists appear to be linked to a movement called “antifa,” which is short for antifascist or Anti-Fascist Action. The movement’s secrecy makes definitively cataloging its activities difficult, but this much is certain: Antifa’s power is growing. And how the rest of the activist left responds will help define its moral character in the Trump age. Antifa traces its roots to the 1920s and ’30s, when militant leftists battled fascists in the streets of Germany, Italy, and Spain. 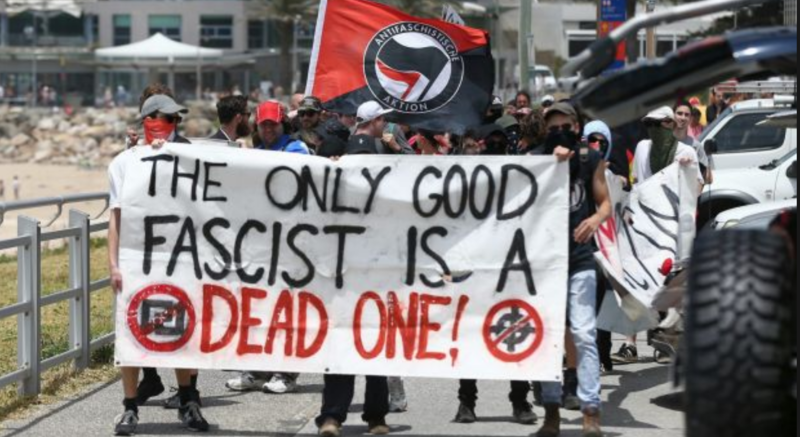 When fascism withered after World War II, antifa did too. But in the ’70s and ’80s, neo-Nazi skinheads began to infiltrate Britain’s punk scene. After the Berlin Wall fell, neo-Nazism also gained prominence in Germany. In response, a cadre of young leftists, including many anarchists and punk fans, revived the tradition of street-level antifascism. In the late ’80s, left-wing punk fans in the United States began following suit, though they initially called their groups Anti-Racist Action, on the theory that Americans would be more familiar with fighting racism than fascism. According to Mark Bray, the author of the forthcoming Antifa: The Anti-Fascist Handbook, these activists toured with popular alternative bands in the ’90s, trying to ensure that neo-Nazis did not recruit their fans. In 2002, they disrupted a speech by the head of the World Church of the Creator, a white-supremacist group in Pennsylvania; 25 people were arrested in the resulting brawl.